We are living in a world where, dangerously, what’s important for the work of many is just to show results. Perhaps for that reason, for nostalgia, convenience, desire, hope, belief, deception or passion; we make the mistake of looking to Havana and distorting the reality, imagining the Cuban government as a bankrupt controlling consortium. Sorry, but much to my regret, impartially, things don’t appear the same. The government was reorganized, continuing to take well-aimed steps toward their new legitimacy, and the ruling elite gathers strength obscuring people who have proven to be loyal and capable of obeying every order, including confessing to homicides not committed. So things go. 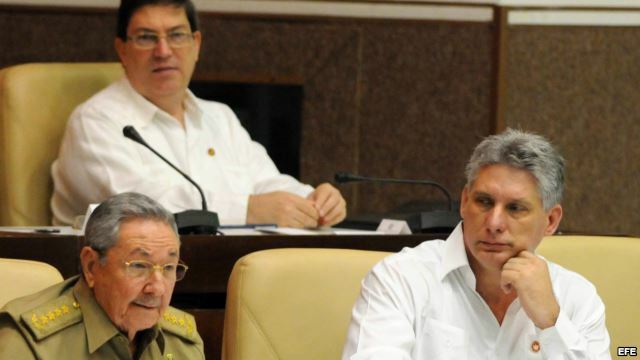 Last May, by presidential decision, the first secretaries of the Cuban Communist Party (PCC) in the provinces of Matanzas and Artemisa were relieved of their posts, curiously both provinces located in the west of the country. Then, as recently as last week, the same changes were made against the party bosses in Guantánamo and Holguín, located in the south and north. It’s reasonable to think that because the circus elite is aging and with the intent to make their mark on eternity, they seek certain changes to show a much more heterogeneous composition of the deputies who have the opportunity to approach with a much more integrated focus the search for solutions to the current problems in different sectors of our national life. I think not, and I feel disillusioned, their only goal is to reconquer spaces, regions and areas. The General, corresponding to his background, applies military strategy. It was no accident that the National Defense Commission of the Cuban Parliament (led by its president Brigadier General Juan Rafael Ruiz Pérez) in session this July 5, ordered the participants to immediately execute a new set of measures to strengthen and expand the power, already excessive, possessed by State Security and the National Police. It’s the same as imposing citizen peace at the stroke of a major, the whip and the barracks. And to round it off, the recently concluded seventh plenum of the Central Committee of the Communist Party of Cuba, trumpeted the appointment of 11 new members, while removing from its ranks leaders who, although it seemed new to many, had already been removed from office in September 2012. It’s worth noting the case of Misael Enamorado who, being “enamored,” had his head in the clouds and not recognizing the laws of gravity instead of falling, rose, taking on new functions putting him closer to the euro, the dollar and the sun. Different but at the same time similar, he succeeds the former president of the National Assembly, Dr. Ricardo Alarcón; who instead of being awarded a well-earned place as an air traffic controller, is reassigned as adviser to the President to deal with — in what appears to be a parallel government — everything concerning relations between Cuba and the United States. I don’t know about you, but to me all this, more than any commentary coming from the other side, forces me to think that the Commander-in-Chief is paving the way he announced last February, in a very hurried way, to allow him to exercise his “right” to retire from the Government, completely monopolize power, and dictate the decisions of the State from behind the scenes. ~ by Auto Post on July 16, 2013.